Water heater temperature and pressure relief valves, or T&P valves, are a safety feature found on all tank water heaters. The valve should always be in good working order to ensure the water heater is safe in the event of extreme pressure buildup. It’s designed to open temporarily and discharge short spurts of water when the temperature exceeds about 210 degrees F, and it releases pressure if the tank gets above 150 psi. It’s important to locate your hot water heater pressure relief valve so you can test it at least once a year and address leaks as they occur. Where is the Water Heater Pressure Relief Valve? The T&P valve is usually located high on the side or on top of the tank. 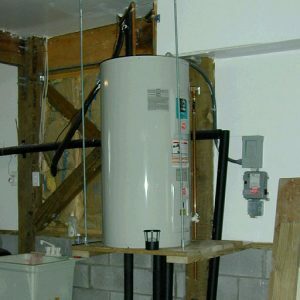 It’s connected to a pipe that runs down the length of the water heater and stops a few inches above the floor. The valve itself consists of a flat, inch-and-a-half-long lever that lifts and lowers when water is released to reduce the temperature and pressure within the tank. It’s recommended that homeowners test the hot water heater pressure relief valve at least once a year to make sure it’s functioning properly. Now that you know where the T&P valve is located, you can test it with ease. The most important test is to ensure the T&P valve operates correctly. If it doesn’t, pressure could build up inside the tank and become a safety hazard. Before you test the T&P valve, make sure a pipe is connected to it that guides discharged water to a floor drain or basin below. Then, lift up on the lever and listen for water discharging from the tank and exiting the pipe near the floor. This indicates a successful test and tells you the valve is working correctly. If water doesn’t discharge from the valve, or the lever is stuck in the closed position (don’t apply excessive force to open it), this could mean naturally occurring mineral deposits are blocking the waterway, rendering the valve inoperable. Turn off the water heater and call a plumber immediately to replace the valve. If you hear the sound of trickling water coming from the hot water heater, the T&P valve may be leaking. This could mean the valve is defective and needs to be replaced. It could also indicate that the water pressure regulator valve or thermostat is faulty. Or it might mean the valve is doing its job by releasing excess pressure inside the tank. All of the potential reasons for a leaky T&P valve demand attention, but first you must test whether your valve is leaking. Check for water pooling around the tank. Then, touch the drain line with your hand to see if it feels warm. If so, this is where hot water is leaking out of the tank. Hire a plumber to determine the cause of the leak and replace the hot water heater pressure relief valve if necessary.